Tom Steele was playing polo while attending Stanford University and, through a contact, received encouragement to go to Hollywood and try his luck in films. Over the next 40 years Tom Steele worked for all the studios, but the bulk of his work was done at Republic in over 100 of their westerns and such serials as “Undersea Kingdom” and “Mysterious Doctor Satan” in both of which he played mechanical robots. 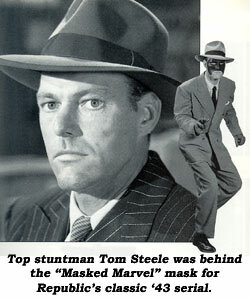 Tom appeared in 50 Republic serials, playing parts and doubling for such stars as Allan Lane and Clayton Moore. 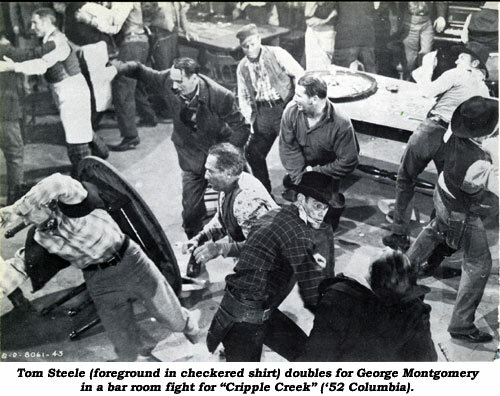 Tom credits veteran stuntman George DeNormand with getting him his first stunt work; he stayed with Republic for 25 years, eventually becoming their stunt ramrod in charge of all action on the lot. Steele was born June 12, 1909, in Scotland. He was a mere two years old when the family moved to New York. His dad was a construction engineer and headed for San Francisco after the earthquake to help with rebuilding and remodeling of the still devastated city by the bay. As a child, Tom had his own Shetland pony which honed his riding skills for his film career. At the tender age of 14 Tom went to work in a steel mill making nails. Graduated from Stanford University on a football scholarship, in 1928 he was hired to work in an ad for a film company that came on location to Palo Alto near his home. This whetted his appetite to learn what the film business was like and, a few years later, with the aforementioned contact through polo, Tom got on a boat and went down the coast to L.A. He checked into the Biltmore Hotel downtown, not realizing he was miles from Hollywood. He asked a cop for directions and got on a double-decker bus to Hollywood. Meeting some Hollywood cowboys hanging around the studio casting departments, Tom was hired as a rider on “Lone Star Ranger” (‘30) starring George O’Brien. In short order his next job was at MGM where he was hired on a Norma Shearer film that needed fellows who could play polo. His expertise on a polo pony kept him employed for a month on this film. He saw the film business was in need of good horsemen with athletic ability and, shortly thereafter, his stunt career began in Hollywood, including work in Mascot serials in ‘34-‘35, and continued for the next 45 years. 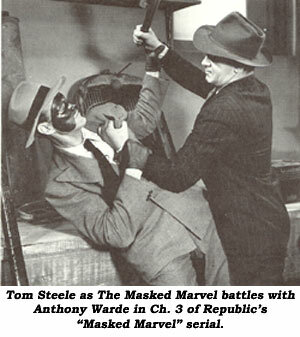 Tom’s career hit a kind of milestone in 1943 when he was selected to play the title role in Republic’s “Masked Marvel” serial. Sadly, he received no screen credit as it was the studio’s policy not to list stuntmen in the credits. This would soon change, as all Republic’s stunt aces constantly did parts and doubled the stars besides. Tom’s career included such films as “Captain Blood” with Errol Flynn and even work in the Our Gang comedies for Hal Roach, but it is his tenure at the Republic action factory for which Tom is revered. Checking his credits you’ll find Tom in every Republic serial from “Spy Smasher” in ‘42 to “King of the Carnival” in ‘55. It was an amazing time to be a stuntman in Hollywood and Tom Steele would become one of the film colony’s master craftsmen. Besides doubling Allan Lane and Bill Elliott throughout their careers, Tom did stunts for such greats as Gary Cooper, Randolph Scott, Joseph Cotten and a young James Arness. When Tom hit 65, he retired, but the phone kept ringing and he found himself working on such things as “The Blues Brothers”, “Bullitt”, “Tales of the Gold Monkey”, “Dukes of Hazzard”, “The New Centurions” and “Conquest of the Planet of the Apes”. Tom was active as long as he wanted to be, and was respected by his peers as only a few other stunt performers ever have been. I only knew Tom slightly in his later years and would chat with him about the glory days at Republic whenever he dropped by the Stuntmen’s Association office. Sadly, Tom left us November 4, 1990. He was 81. His legacy will live forever with movie fans the world over.